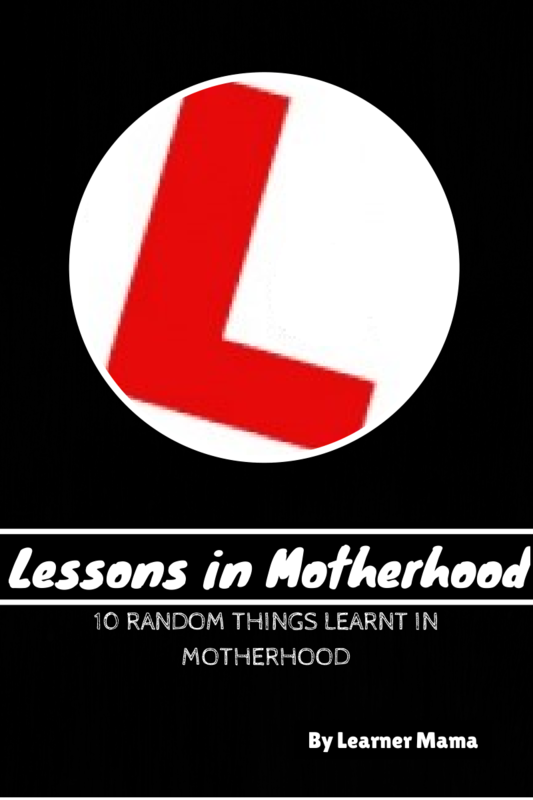 I have learnt a lot as a mother – practical things like how to change a nappy, feed a baby, fold and unfold the most complex buggies, how to cope with tantrums, the list goes on and on but I am constantly learning (that is why I am Learner Mama). I have decided to share ten random things (many of which surprised me and certainly weren’t to be found in any baby book that I read) I have learnt as a mother (to date). Baby boys have erections – who knew! This was a surprise to me – I thought they were something that developed when they were older. No one prepared me for the day I opened the nappy and discovered that one! Sleep deprivation is painful – I now understand why it is used as a form of torture. I can sleep on a 2 inch width of bed space (ok, maybe a slight exaggeration but 6 inches tops!) usually with a child (practically) on my head. Soothers are magic – there is no other explanation. If you need to get up early your kids will sleep in and if you want a sleep in your kids will bounce into you at 5am – go figure. They grow fast. They are tiny for such a short time enjoy it (as much as the sleep deprivation allows) because before you know it you are packing them off to school. There is a direct correlation between the number of kids and the cleanliness of my house…let’s just say they are messy little beings! I never thought I could love another human so strongly (sorry husband) but I have managed to do it times three. It surprises me each day how much I love these three tiny humans and how that love grows every minute of every day. Thanks Naomi! Can’t wait to see your list! Yes to so many of these!Great list and linky. will definitely be linking up. Thanks and thanks Aedin!! Look forward to reading!! Love your list – number 1 is so true and needs to be SHARED because peopled don’t know and it freaks us out!!! Oh yes it freaked me out alright 🙂 thanks for linking up Office Mum! Yes, totally agree with every one! Great post! I’ll get working on my list and will link up- great idea for a linky! Have a lovely weekend! Ciara @ Our Little House in the Country recently posted…Simple Outdoor Fun and Games – My Country Kids at Play! Thanks Ciara! Look forward to seeing your list when it’s ready! Have a great weekend too! I’m off to read the rest of the links!!! Thanks Louise! Can’t wait to see what you’ve learnt! Great idea! Number one was definitely a surprise to myself and my husband. Thanks Sheila and thanks so much for taking part. Love having the new mum perspective. Love your list especially no 1. I can’t remember when I discovered it myself but I remember the day my husband discovered it. Still laughing over that one. Definitely with you on no. 4 too. Thanks Una! Glad you enjoyed it! No 1 seems to be a common surprise!! Number 1. OMG! I had no idea! Obviously no baby boys in this house! Thanks so much for hosting a great linky. So many interesting takes on things. I’m learning so much! Thanks so much for taking part! Great to have the twin parenting perspective! Thanks Aedín and thanks for including your gorgeous post in the linky! Thanks so much This is Motherhood! Can’t wait to read your post! Great post and idea, Lucy! I had to laugh at the first one. No one really gives you a heads up of what’s in the nappy, do they?! Thanks so much Louise! A fantastic angle for the linky! Thanks so much for sharing your insights and your fabulous family photos! Gorgeous! It’s all a learning curve for sure! It’s laugh or cry stuff at times but you’ve got a just enjoy it! Thanks for your kind comment!